The digital currency movement has shown that the monetary system does not have to function as it always has. There is potential for new methods of creating, using, and governing digital forms of currency. For example, most fiat dollars printed by governments all around the world do not have any supply limits, as more can always be printed if the supply runs low or the population increase demands for it. With Bitcoin, on the other hand, it is a much different story. When the digital currency was first invented, it was coded into the platform that there would be a finite supply of it, and it is impossible for that cap to ever be altered. The amount of Bitcoin will never exceed 21 million due to the limitations that Satoshi Nakamoto placed on the Bitcoin creation algorithms. While the infamous developer has been very limited in his description of why he programmed the digital currency in this way, this decision was made with the longevity of his cryptocurrency in mind. Bitcoin was the first successful digital currency in the world to stray from the centralized money structure in society. Rather than working through a centralized bank that controls the output and creation of new funds, decentralized cryptocurrency platforms can be programmed by their creators to have limited supplies. On the other side of things, banks and the federal government can increase or decrease the total supply of money either in a reserve or in circulation at any given time using a method called quantitative easing. As we have seen, this method is highly speculative, and also is run by a small group of elitists and government officials, whereas decentralized currencies are wholly governed by the community. Decentralized structured currencies often run on a peer-to-peer network, and the method of creating supply is based on the activity of its users. For example, when Bitcoin was invented, its supply was limited to being 21 million. Why did the infamous Satoshi Nakamoto make these decisions? While the answer is somewhat speculative, it was for good reason. With a finite supply of Bitcoin, the price will be more prone to increase as time passes, and more people begin to hold it. This is because of the fact that, in theory, as supply decreases and demand increases the price will also increase. In addition to this, there is an algorithm programmed into Bitcoin’s network that dictates how much of the currency is created at a time. This algorithm takes into mind a variety of different factors such as transactional volume and identity protocols. When two users engage in a transaction, a new block in the blockchain is created. In addition, based on this algorithm, a certain amount of the predetermined Bitcoin supply is created and put into the ecosystem. This mechanism ensures that malicious users do not receive Bitcoin and are weeded out from the system. It also helps to slowly decrease the amount of Bitcoin that is created based on how large the user base is. So, as the Bitcoin economy grows, less and less Bitcoin is being created. With such a seemingly strict protocol in place for the better handling and tracking of digital currency, there have still been millions of Bitcoin that have become “lost” or are otherwise not really in circulation. So, why has so much BTC become essentially lost forever? It is not a result of Bitcoin or its blockchain technology, but rather has to do solely with its users. According to a study performed by the Bitcoin blockchain research firm, Chainalysis, there are between 2.78 million and 3.79 million Bitcoins that are gone forever. This research indicates that anywhere from 13.9% to 18% of the total Bitcoin supply will never see circulation. The Chainalysis findings show that between those who were holding BTC and lost them (via either losing private keys, hard drives etc. ), sending BTC to incorrect addresses and Satoshi Nakamoto’s 1.04 million original coins, there is at least 2.79 million BTC gone forever. Digital Bitcoin wallets require strict security in order to maintain the psuedo-anonymity and versatility that they need to possess. If a password, private key or the authentication code attached to a wallet with Bitcoin in it is lost, those Bitcoins are essentially lost forever. 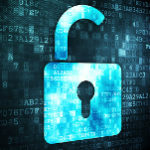 The decentralized structure of Bitcoin encrypts all information stored in the blockchain, and without your private key, there is no way to retrieve this information. As inflation continues to grow nearer and nearer to zero, the amount of block space available to verify transactions is also becoming a valuable commodity. Miners; the individuals responsible for verifying transactions, creating new blocks, and thus creating new Bitcoin, are seeing that it is harder to verify transactions as supply is decreasing. This trend is resulting in higher transaction fees associated with Bitcoin transactions in order to ensure miners are being rewarded properly for their support to the network. 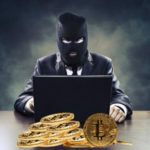 Bitcoins are sometimes “destroyed” in this process if it is deemed a user has malicious intentions or used malicious means to obtain the Bitcoin. Another way Bitcoin is destroyed is through miner underpay. 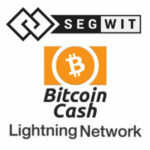 This occurs when a miner verifies a transaction and deliberately opts to take less of a fee from the transaction. This action can help to verify transactions faster if block space is found, but it comes at the cost of basically destroying the difference in Bitcoin from the discount that was achieved. 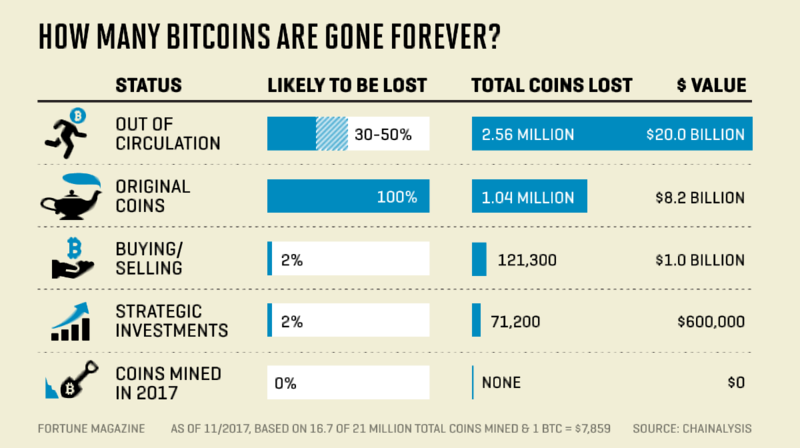 Due to the multiple factors behind the mechanism of Bitcoin destruction, it is estimated that nearly 25% of all of the Bitcoin that has been mined so far has either been lost or destroyed. The total max supply of Bitcoin is 21 million, but the total spendable supply is much less. Bitcoin is currently similar to a real estate market. As we are closing in on the total supply, we are seeing that block space is becoming more and more scarce, and hence it is harder for miners to find this space and make a profit from mining. This process has led many to believe that Bitcoin will become less stable as it grows, and unless the currency can scale, this may be the endgame. The total supply is dependent on the accidental loss and destruction rates of Bitcoin as well, and this number is what helps to determine the overall price of Bitcoin at any time, along with other similar factors. Satoshi Nakamoto thought ahead when designing his platform, he understood that in order for it to be decentralized, the community must be able to run and govern it. As we get closer to the final supply of Bitcoin, the block reward is decreased and made up for in transactional fees. This mechanism may prolong Bitcoin’s lifespan, but many critics say that it is hard to support long-term without mainstream adoption. The enigmatic founder of Bitcoin has been very silent about his reasons for the programming decisions surrounding his digital currency, and it remains to be seen how well the currency will function as we close in on draining the total supply of Bitcoin.